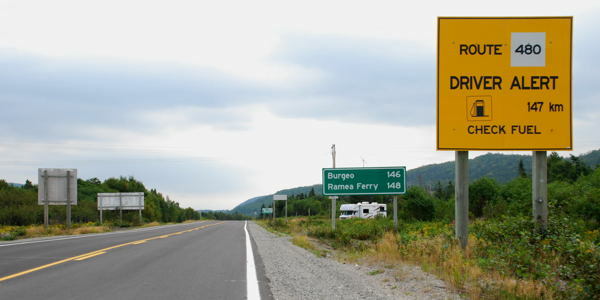 Warning sign at Route 480 to Burgeo: next filling station at 147 km. The road distances and estimated driving times below have been derived from the Road Distance Database of the Newfoundland & Labrador Statistics Agency. All distances are in kilometres (To convert to miles divide by 1.6); driving times are in hours. Driving times are estimated on average speed limit of individual road segments, but with a maximum speed of 80 Km/h. For road distances and driving times between destinations on Newfoundland not mentioned in the chart above, please consult the Road Distance Database.